Clarity, simplicity, and transparency are at Quik's core - meet out fully integrated, automotive platform product packages. 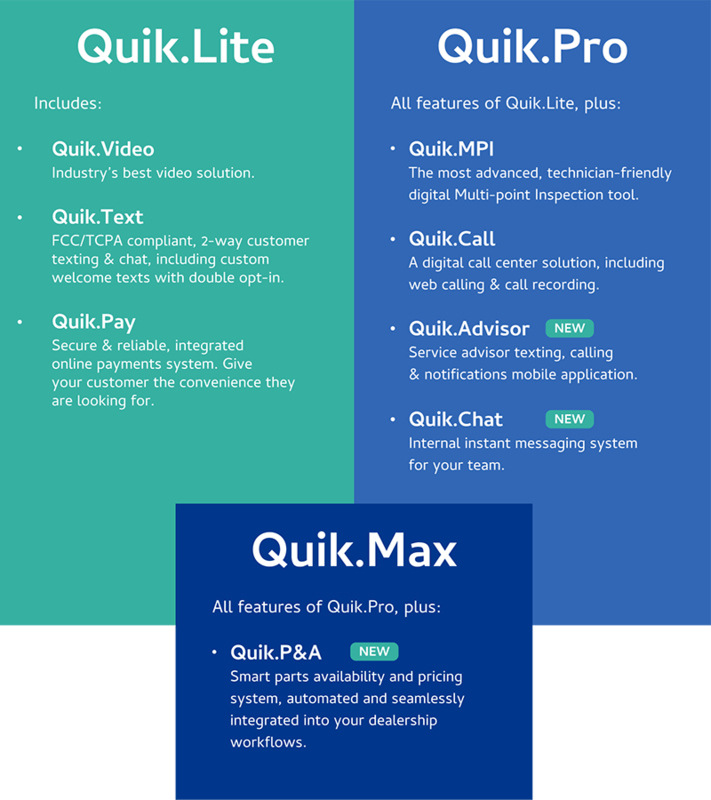 The Quik platform has significantly expanded in the last year, both in the number of features that we are offering to automotive dealerships, dealer groups, and OEMs, and the completeness of the service process. Quik’s simple and easy to use, innovative automotive dealer software solution now encompasses the entire service experience, delivering increased revenues, boosting customer retention and greatly enhancing process efficiency. We are proud to announce our new product packages, allowing us to easily cater to dealerships of all sizes and seamlessly adapt to existing processes in any franchise dealer workshop, providing the most advanced and fully integrated end-to-end aftersales platform in the automotive industry. Please visit our product pages to learn more about our car dealer software platform features and capabulities. Ask us about our competitive pricing, tailor-made for your store and brand, and our 90-day money back guarantee.